Today VicRoads was forced to release documents under the FOI act to Greg Barber MLC, and only after direction from VCAT . These reports and maps are now published on Greg Barber’s site. These documents show the road is a dud, even when measured by the narrow financial criteria used by the proponents. 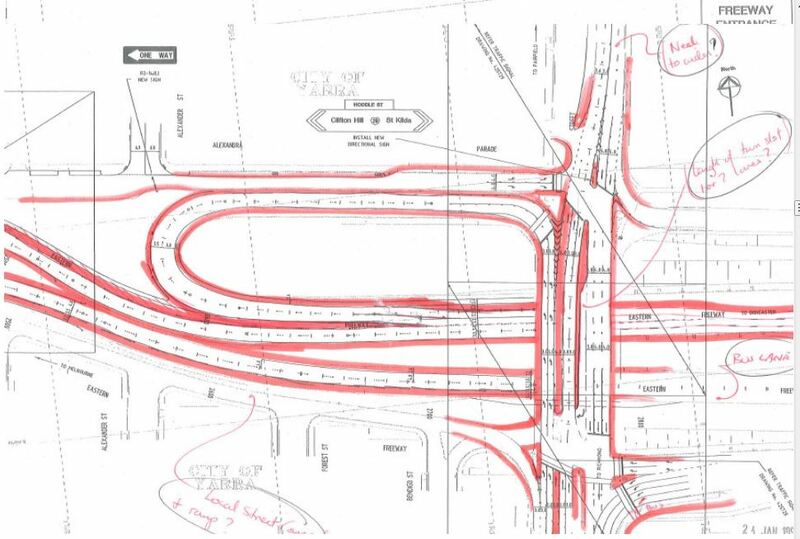 Among the documents are detailed diagrams of the Clifton Hill interchange, with pencil notes. These show additional tunnel portals on each side of Alexandra Parade, west of Wellington St.
Click on each image to enlarge or open the PDF report. Previous Clifton Hill Interchange – Alternative Options?